NOT LONG after moving into Long Meadow Farm we got on with the job of sourcing our livestock. Amongst our initial purchases were two shetland sheep, which we bought locally. Unknown to us was the fact that both of these sheep were expecting lambs. As you can imagine, it was a rather big surprise when I walked up the field one day to be greeted by a ewe with her newborn lamb. Everything was going so well for 36 hours or so but then quickly went down hill from there. The ewe rejected her lamb and there was nothing we could do. We tried everything but couldn’t bring them back together. Wendy and the girls bottle fed the lamb who was soon named ‘Pip’ and she quickly began to thrive with the vast amounts of TLC and cuddles she was receiving. The second pregnant ewe went on to have her ram lamb and made a fantastic mother without all the drama her sister went through. From the day Pip was rejected, the ewe was referred to as ‘Useless Mother’. That was until 2pm on 29th April 2015, when she became the star performer from our little flock. Not only did she give birth to our third set of twins, but they were both female. 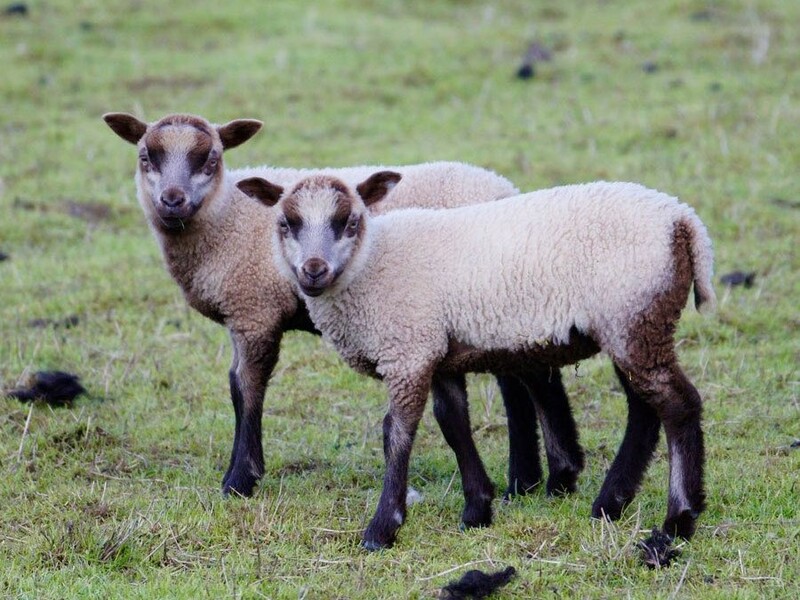 We recently organised a little competition to name the two lambs and their mother (Useless Mother wasn’t very fitting any more) with the result being that the family are now known as Delilah (mother) and Daffodil and Daisy, her twins. They are the cutest pair of twins you could ever imagine and are growing up fast, in fact too fast. They are undoubtedly the most mischievous lambs we have and because there are two of them it just makes for double trouble. They are the ones who lead the other lambs into bother and get away with far too much around here. For now, the lambs are small enough to squeeze under or through the post and rail fencing and so they are constantly organising expeditions out of their field into neighbouring ones, including visiting ‘Dad’ in his nearby home. When they take the gang to visit Dad, Daffodil and Daisy are the only ones he allows to clamber all over him and they regularly do. Time and again I’ve had to go in search of these renegades and then set about trying to get them back home to their mothers. Recently, after one of my many eventful evenings chasing them across fields, I was considering that there must be a better solution. I tried lots of shouting and various hand waving and clapping techniques, but none of these worked. It was then that I witnessed a miracle happening before my very eyes. I had been tracking down a gang of seven lambs, including Daffodil and Daisy. When I spotted them in the cattle field I used my fingers to whistle loudly and get their attention, or so I thought, but just like magic they all turned and without any delay ran full tilt across the two fields, squeezing back through the fences and reuniting themselves with their mothers. Well, that’s a bit lucky I thought, but no it’s not luck, it works every time, including tonight when the twins and ‘Flash’ had snuggled down with Dad for the night. All the same, I am looking forward to the day when the they can’t squeeze their chubby little bodies through the fence any more.